Nothing like a cold beer and some sweet tunes to help you cling to your understanding of reality by the fingernails. Almost every episode of David Lynch’s Twin Peaks: The Return has featured a live performance, from bands ranging from Au Revoir Simone to Sharon Van Etten. The latest act to swing through the Pacific Northwest? Nine Inch Nails, who capped off tonight’s eighth episode with the song “She’s Gone Away” from their 2016 album Not the Actual Events. 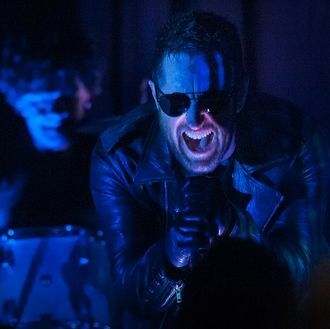 Front man Trent Reznor previously collaborated with Lynch on the score for the director’s 1997 film Lost Highway, so of course NIN played something real soothing designed to make all the Bang Bang Bar patrons feel comfortable, like they have a real handle on what’s going on in their cozy little burg.